Select one of the videos listed and Click the Share button to Share the video. President Barack Obama will speak at the Vietnam Veterans Memorial on Memorial Day 2012, as part of the Defense Department’s commemoration of the 50th anniversary of the Vietnam war. Call For Photos Event Saturday, January 21 at 11 a.m.
A few days before Christmas each year, the Memorial Fund staff and volunteers decorate a Christmas Tree at the apex of The Wall. The tree is decorated with thousands of cards sent to the Memorial Fund each December in honor of all America’s service members – past and present –and their families. The 11/11/11 Veterans Day Telethon event webcast will feature appearances by well-known national media journalists and guests to include Bob Schieffer of CBS News, Bob Woodruff of ABC News, Kelly Wright of the Fox News Channel, former U.S. Senator Chuck Robb, former Homeland Security Secretary Tom Ridge and syndicated radio host Rusty Humphries, whose father died in Vietnam. The Telethon webcast will include live coverage of the Veterans Day Ceremony at the Wall to begin at 1 PM ET. Crews worked through the night in New York City’s Times Square to erect the Wall the Heals, a half size travelling replica of the Wall at the Vietnam Memorial in Washington DC. 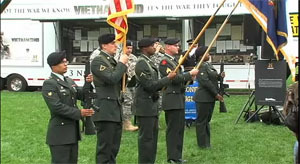 Ceremonies then marked this stop on the nationwide tour in the Call for Photos campaign by the Vietnam Veterans Memorial Fund and the History Channel. The Photos of service members whose names are engraved on the Wall in the nation’s capital will find a home in the Education Center to be constructed at the Vietnam Memorial.